"We are very pleased with both the quality of our house and the experience of working with Enviro Custom Homes and their employees. We recommend Enviro Custom Homes without reservation to anyone interested in building a new house, particularly an environmentally responsible one." With the abundance of electric power in this country, architects have come to rely on artificial lighting for most buildings, unlike Europe, where using “solar power” in its “light” form to illuminate buildings is a common architectural technique. When you consider that one square foot of sunlight passing through clear glass can illuminate 200 square feet, it seems ludicrous, almost spendthrift, not to take advantage of it. 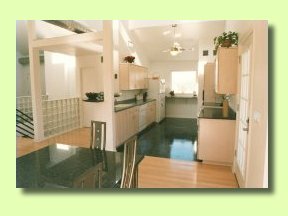 At Enviro Custom Homes, it is one of our Healing House© design principles. An integral part of passive design - that is, just letting the house reduce our energy costs while it sits there and does nothing - requires our knowledge of the direction of winter winds so they can be prevented from penetrating our house, as well as how cooling breezes flow through in summer. At Enviro Custom Home, proper design shields our homes from northwest winds in winter, and windows that open on the southwest and southeast encouraging air flow through the house to openable north and east windows (assisted by ceiling fans) can reduce spring, summer and fall cooling costs significantly. Passive solar is the kind of heat you find in your car when it's parked in the sun on a very cold day. Your car is a “passive solar collector” - that is, it gets heat from the sun without doing anything active. 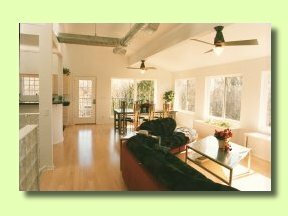 Proper building design allows passive solar heat into the house in winter, and keeps it out in summer. 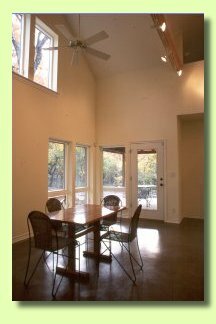 Houses in Texas can get almost 100% of their winter heating from passive solar without negatively impacting summer cooling costs if they are designed right. Most of our homes use geothermal heat pumps, properly sized, for mechanical heating and cooling. Sometimes called Ground Source Heat Pumps, these are the most efficient systems available with Energy Efficiency Ratings (EER) of 16+ on high speed and over 20 on low speed. Because our homes are so energy efficient, the units can operate at low speed most of the time. That means, at 20+ EER that you get more than $2 worth of heating or cooling for every dollar you spend on your utility bill. They also reduce the Peak Load for utilities, preventing them from having to build more polluting power plants. There is nothing revolutionary about rainwater collection. Many of our grandparents collected rainwater in cisterns or barrels out behind the barn, just as it had been done for thousands of years around the world. Today, rainwater is used extensively in Australia, Bermuda, the U.S. Virgin Islands and Hawaii. Even skyscrapers in Hong Kong are collecting and using rainwater. 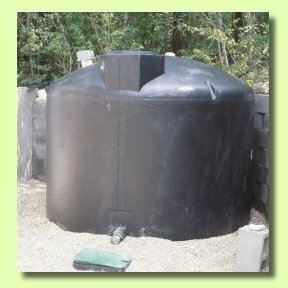 Enviro Custom Homes will help you find the right sized tank, install it under your gutters, and even show you how to purify it for drinking if you ever need to. Since water will be the oil of the next century, harvesting it off our roofs makes infinite good sense. “Graywater” is simply water that has been used for washing clothes or bathing - bathroom sink water, bathtub and shower water, and washing machine water. A single bathtub of “graywater” can irrigate 300 square yards of landscape, and the phosphates in the soap are good for for green, growing things. (“Blackwater,” the water from toilets and kitchen sinks, on the other hand, cannot be used for landscaping unless it is more thoroughly treated, usually by combinations of green plants and sand filters.) At Enviro Custom Homes, we help you select a graywater system interconnected to your sprinkler system. If you are on a septic system, it costs no more to have a graywater option added. An integral part of living lightly on the earth is learning to adapt ourselves to its natural surroundings, not constantly feeling it is necessary to alter them to suit us. There are natural plants that have perfectly adapted themselves to our individual climates over eons. We use these in the landscaping and gardens attached to our Enviro Custom Homes. They are not only beautiful and maintenance free, but they require no extra watering (unless there is a serious drought). Why use solar for water heating? First, it's clean energy. Second, it saves you money. Keep in mind that on your annual utility bills, you spend 37.5 percent on home heating, 30 percent on water heating, and the balance for refrigerators (9 percent), cooling (10.3 percent), lighting (4.8 percent), television (2.7 percent), clothes dryers (2.1 percent) and other miscellaneous things (3.6 percent.) If you can reduce your utility bills by 30 percent by using solar hot water, it makes good financial sense. There are many types of solar hot water heating. Enviro Custom Homes can help you select the right one. The entire top surface of the now famous little Sojourner, which explored Mars, is made up of photovoltaic (PV) electric cells. Now PV cells are laminated to roofing materials, including standing seam roofs, metal shingles, and asphalt shingles. They can also be purchased as panels and installed on any roof. A small system (2 KW or less) integrated onto your roof top will power selected things in your home on a daily basis, reducing your utility bills by the amount of power you make (net metering - it runs forward when you use their power, and backwards when you use your own.) Oft-asked question: Yes, the most common PV panels have been tested to withstand one-inch diameter ice balls (hail) at 70 mph. The electrons created by your PV system produce direct current (dc) that can be stored in a battery for future use, or converted to alternating current (ac) for use in your house. We see many who are following in the giant footsteps of Rachel Carson, a ‘50’s-’60’s era ecologist and author of the epochal and profoundly disquieting book, Silent Spring, warning of the same things: the contamination of the natural systems that sustain our planet. We are still overusing chemicals poisonous to all living things. When we can see the air we breathe, it is obvious we are overusing polluting fossil fuels, both for electricity used in buildings and for most transportation. Most builders still build houses with slight regard for the potential, even, of free energy-saving techniques like passive solar which costs nothing, much less creating a holistic, energy-saving building envelope coupled with the right mechanical systems. What does it say about our culture that we pay so little attention to these environmentally destructive practices? What does it say about us as individuals that we care so little for the welfare of this beautiful planet, and for the future, unto the seventh generation, of our children and grandchildren? We must begin thinking of houses - and other buildings - as engines that give back energy, not consume it. Only when the environmental values we know are right in our hearts match our actions in this world, will we be truly whole. And only then can we truly do our part to bring light and healing to this beautiful, lonely, blue spaceship we call home. That's why we, at Enviro Custom Homes, join together to help you fulfill your own housing and environmental dreams by "making it easy to do the right thing."